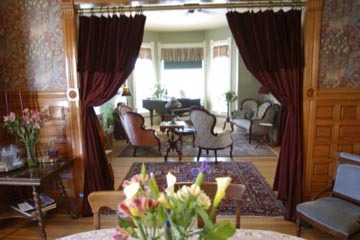 The Sanders Bed and Breakfast mansion was built in 1875 by Wilbur and Harriet Sanders who arrived in Montana (then part of Idaho territory) in 1863 with Wilbur’s uncle, Sidney Edgerton. President Lincoln had appointed Edgerton as the chief justice of Idaho Territory. Severe weather forced the party to stop in Bannack for the winter of 1863-1864 instead of going on to Lewiston, Idaho Territory. In 1864, Justice Edgerton returned to Washington, D.C., to successfully argue the case for a distinct Montana Territory. Upon returning, he was appointed the first territorial governor of Montana in the capital of Virginia City. Meanwhile Mr. Sanders traveled the Bannack-Virginia City route and earned a reputation as a fine young lawyer and an organizer of the vigilantes who eventually prosecuted the Henry Plummer gang. From Virginia City, the family moved to Helena and eventually built their home at 328 North Ewing in 1875. Mr. Sanders was active in a number of civic projects: he was the first president of the state Bar Association and Historical Society, a trustee of the public library and the Helena public schools. When Montana gained statehood in 1889, Mr. Sanders was one of two from Montana to serve as senators of the new state. He died in 1905 and is buried in Forestvale Cemetery north of Helena. Harriet Peck Fenn was born in Tallmadge, Ohio. 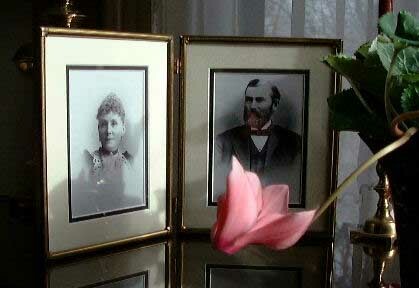 In 1858, she married Mr. Sanders and they had five children, three of whom survived. James and Wilbur were with their parents on the journey from Omaha, and Louis was born at the rugged gold mining camp of Bannack. From all accounts, Harriet was a talented mother, an artist, and community leader. One of her large oil paintings hangs in the sitting room exactly where she is said to have displayed it. Mrs. Sanders also distinguished herself in the movement for the women’s vote, earning herself a letter of recognition from Susan B. Anthony. At the time of her death in 1904 she was described as taking “an active and important part in this evolution of Western life, which included church work…” One friend said “In all kinds of trouble she was my friend.” The officiating minister was said to observe that no better epitaph could be imagined.